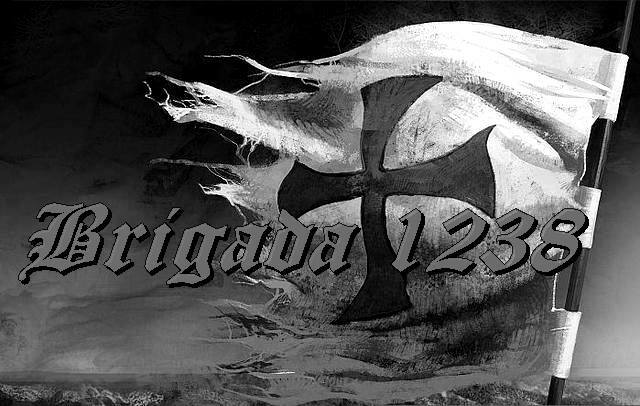 Brigada 1238 from Valencia, Spain seems to be recording new stuff for an upcoming album. So we decided to make an interview with the band. We talk about their former guitarist Toni Ortiz who died in October '07. Toni played in Division 250 before he joined Brigada 1238. Hello! Can you start with giving us a background history of your band. Hello, at first we were a group of five friends that had the same interests about way of life, politics and music. Some of us had the pleasure of playing in previous bands, but in 2006 we decided to change the direction of our style and formed Brigada 1238. Since that moment until now, we have recorded three albums and as we appear in another ones. Toni was one of your members. Can you describe him as a person? And what will you alway remember from him? Well, Toni Ortiz was more than a friend. We have Toni as a fathers figure too. Not only for his age, but also for his long and experienced lifetime in the fight. He was an active politic member and he loved and played RAC music before all of us started hearing our music. We remember him as a fantastic person and as an example of fighting career against the political situation. In order to remember him we recorded a song in our second album (Recuerdo de ti). I am interested in your bandname. Can you give us an history lesson of wat 1238 stand for? 1238 is a date. It was the year in which Jaime I, a Christian king, reconquered Valencia kingdom. Until that moment the Muslims were dominating our country and these century was the beginning of the reconquer. We are proud of this year. You seem to have interest in history. How do you look at the government's and media's role how they try to focus away from your history, pride and traditions to uplift gender mainstream, multiculturalism instead? Governments are usually accustomed to do what the most powerful enterprises want in order to satisfy their economic interest. It's only a question of money. Our identity has been erased and it doesn't matter. People don't fight for anything. We believe in a great Europe where nations forming alliance and defends our interest and our people. Multiculturalism is destroying all for which our parents have fought in their lives. When did you first get into nationalist music? We love RAC music since we were young. Playing in a band with friends sharing the same ideas is a luxe. Some of us have been playing in other bands before the creation of Brigada 1238. One of your latest releases is a MCD under the name "Identidad" that was released under 2013. What were some of the lyrics and subjects about on that MCD? "Identidad" have 4 songs and it has a offensive sound in all of them. Track 1: Identidad: we talk about reacting for the bad situation we have in our country since the crisis. Track 2: Fight for my land: it's perfect for understand what a father feels when he has to fight for his family and for defending Europe. Track 3: Gloria a España: a song dedicated to the king who reconquered Valencia. Track 4: Morir por ti: you can die for your fatherland and family. And now recently I saw that you released 'Live & loud'; would you like to mention something about it? This album is a live one. A friend of us offer the possibility to edit the concert we played in the German party "Fest der Volker" some years ago. People here can listen to our live and loud sound. Any copies left? How can we order your albums? Do you have earlier releases also? Well, we don't know if there are more copies. You can write to brigada_1238@hotmail.com and maybe. The live-album is a very limited edition. Spain from your point of view? How would you describe it? How is the future for your country looking out? Spain for us is the reason why we create music. We love our country, but we recognise we don't have a lovely situation with financial crisis, immigration, people who are being cheated by anti-Spanish movements... There are a lot of things we have to change in the future. The idea for defending a big Europe united for great and strong nations fighting for our culture, people and traditional customs is what we think is needed in Spain. You have been doing lots of live Concerts. Which ones have been the best yet? We have played in Italy three times and in Deutschland one time. For us, we think they were the most important because of the importance around Europe. Venetto Front is the best organization we have in Europe and it's a pleasure to go there. Which band has surprised you with their live performance? How is the future now looking out for you? We have decided to record another album again. In a few months we'll have a good surprise with a powerful sound. We have decided to going on with the band after a bad period where our family situation didn't give us enough time. 1238 will be back soon. From your first album you have a song “Voces de protesta”. Is it conscious from your side to censorship a part in that song? A part of this song had to be censored because of the controversy that exists around the true owners of the New World Order. It's not necessary to explain more. Does jews have great Power to oppress the Spanish people that dare to expose thier pride of thier heritage? We prefer not to talk about that. Thank you! Any last words you want to share with our Swedish readers? We are very grateful for the interview. It's a pleasure to answer these questions for the nationalist Swedish people. Thanks a lot from Spain. In a few time we'll going to record a new album and we would like you to hear it. We'll have some songs in English.